Thanks OP. I didn't notice this, it was in my inbox too. Cheers ! No Email here. I'll check in-store. Any idea if Pax ever go into sale. Just re-read my email looking for the coupon, and you've got to print it out in-store, the IKEA family bit. I received a £30 off £200 voucher instead. Can you spend £250 and get something for £50, then return the £250 things and get the £50 for free? I've logged into my IKEA Family account but no mention of it. I haven't had any e-mails lately either from them. Wonder if only selected stores have it? Wait for your email (if you get one). Just checked my email and not had one, I've had lots of others recently but no voucher. Perhaps store or account specific who knows! Unless I accidentally deleted an email from themwithout looking at it, I haven't received any voucher code from them. I'm actually in the market for a new bed and some furniture, so this would have been ideal for me. I only got £5 off a £40 spend. Why has this only been posted today??? Have not had any emails I’ll be spending around £400 in Ikea this week so this would be great to get anyone got any ideas how to get a coupon ? 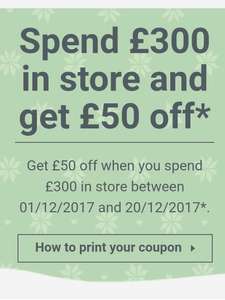 Can you spend £250 and get something for £50, then return the £250 things a …Can you spend £250 and get something for £50, then return the £250 things and get the £50 for free? I asked about the same a guy in store a year ago and he said yes. That time it was for beds only, but he said IKEA is not gonna investigate in that as it’s very small % of customers. Dont think I have ever got one. Spend £300 in store, get charged £25-£35 delivery then get £50 off more like. Mine was spend £70 get £10 off ... which I've just read after spending £100 tonight. I could cry. for anyone that recently bought something but doesn't have it to return as long as you have the original receipt just go back in and buy some of the exact same items making sure that the product codes match the receipt. Then go directly to returns and hand them the old receipt. Yes this is a borderline move but it's Christmas and if you have a bad conscience then donate some of the money to your favorite charity. Nothing in my inbox and about to drop a lot at Ikea tomorrow on a new kitchen! Come ooooooon e-mail! Edit: Got the e-mail in my junk folder. The subject is "Let's celebrate Santa Lucia", as stated in another post on this. And I got..... no coupon at all :-( . Thanks Ikea. didn't get anything. Need to buy a lot of stuff from ikea. If anyone has a coupon but can't find any use of it, could you please kindly pm me (I probably need your family card number too), please? Nothing in my inbox and about to drop a lot at Ikea tomorrow on a new …Nothing in my inbox and about to drop a lot at Ikea tomorrow on a new kitchen! Come ooooooon e-mail!Edit: Got the e-mail in my junk folder. The subject is "Let's celebrate Santa Lucia", as stated in another post on this. And I got..... no coupon at all :-( . Thanks Ikea. Guys can someone please confirm some details on this 'offer' as it's a little confusing. Do you just need to wait to see if IKEA email you with a voucher to print off if your already an IKEA Family member? 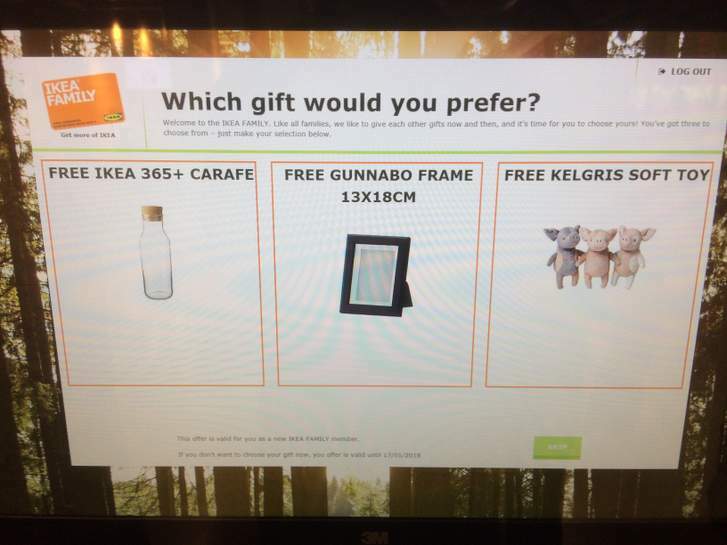 Do you go to one of the IKEA Family kiosks and login to see if your eligible for one of these various discounts and then print it off there and present at the till etc? I’m off to Ikea Reading this morning so I will see if i can get the offer. I have not had an email. i went last week so maybe they think I am a regular customer?